uTorrent is the most popular App that is lightweight, fast and very efficient and easy to use the BitTorrent client. uTorrent also offers excellent features and offers reliable and complete torrent downloader to the users. It offers greatly comprehensive stats, automatic shutdown, and support for RSS feeds, download scheduler and much more. Though it offers several useful features, it lacks a couple of things including complete torrent search tool and an inbuilt player to preview the download. It allows you to play streaming videos once you download the app, also, you can comment and rate files, you can share the files through drag and drop option, and you can stop the UDP tracker using uTorrent 3.
uTorrent 3 is modified and completely redesigned interface that is considered as the perfect interface for all user levels. The redesigned interface is more usable, perfect match, and easy-to-use web interface. Like previous versions uTorrent 3, is also perfect for all users, from novice to experts can benefit from it equally. However, uTorrent includes several configuration settings that actually more useful for the professional users. This new version also includes various guides for beginners so that they can easily follow the instructions and can make use of the interface completely. After downloading and installing the interface, you can check the initial setting using the built-in speed test, which is very helpful and easy to test, after the test you are ready to use uTorrent. The best part of this new design is, it takes less PC and hard drive resources that facilitate you to download the uTorrent and also you can use your computer without any impediment. If you are looking for a fast, lightweight, and reliable interface, then the uTorrent is the best one to install. uTorrent is a very lightweight as it is just 1MB, which is smaller than a digital picture. It installs very fast and it will not obstruct your PC or hardware resources. With uTorrent, you can download the files very quickly and efficiently without disturbing other activities on the internet. uTorrent is a powerful tool that offers highly advanced settings including scripting, automation, remote management and etc. Bundles It allows you to have a direct access to over a 2 million quantity of content and 10k artists. Also, you can download media straight from a range of artists, authors, bands and filmmakers. When you include new tracker it will add new peers and seeds. Peers means the users who are yet to download the torrent, they can share the torrent only when they finish the downloading. Seeders are those users who already downloaded the tool and allowing other users to download the app. This approach can help the users to speed up the download process. At the same time if you are downloading several torrents, then you should increase more bandwidth to the torrent that you want to download it fast. To download the file you need to right click on the file, and then it helps you to download the file faster. By increasing the bandwidth you can download the files faster, this is one of the ways to seep up the download process. Changing ABS also helps you speed up the download process. To change the bandwidth settings, the first step is choosing the options and click on preferences, you will find a Bandwidth tab there you can change the settings for quicker performance. These are some of the ways to speed up your torrent downloads. uTorrent is safe and free to download. 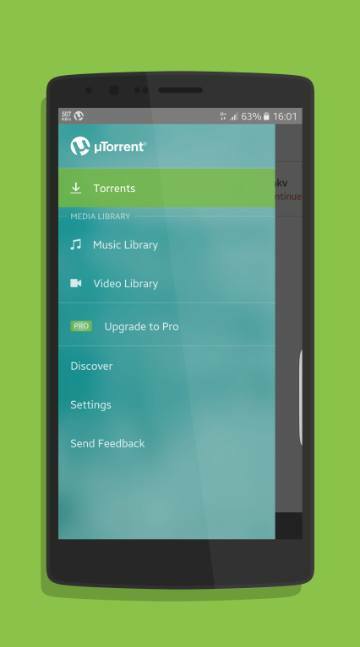 It is one of most famous Bit torrent client that allows you to download and play torrents on your Tablet and phone with the official uTorrent app.